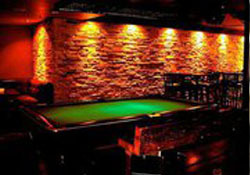 You'll feel right at home in our no-frills, 70's-style billiards bar nestled below Wisconsin Ave. Whether you fancy a meal, a delicious beer, or a game of shuffleboard - we've got something for everyone. 04/22/2014 Bars with Jukeboxes in Washington, D.C.
11/19/2012 Where to Celebrate Thanksgiving Eve in Washington, D.C.